Do you need to haul the family (of humans and/or dogs), but still want to feel like Leah Pritchett on the tree at Norwalk every time you’re at a light? The SRT® team has added a little spice to SUVs from both Dodge and Jeep®: the Durango SRT and Grand Cherokee Trackhawk, respectively. Both are delicious options. And while you’re gonna look super dope dropping the kids off at school, on Saturday, you’ll be able to hit the track and act out those race hero impulses for real and run some legit ¼-mile times. I say “delicious” because I love food and a good metaphor. Before we hit Detroit for dinner, we need to decide what will satisfy our hunger, so let’s lay out a few questions. How big is your family? What kind of price point is acceptable? What do you need to tow? Do you prefer your V8s big and naturally aspirated, or big with forced induction? How quickly do you want to cover the ¼ mile? Let’s be honest, vegans aren’t exactly the target market. And we’re in Detroit, so I’m gonna give a little love to my two favorite spots for these particular main dishes. I think if you’re looking at this pair of SUVs, it’s kind of like choosing between a large meat lover’s pizza from Pie-Sci or a filet mignon, medium rare, with crispy potatoes from Roast. Say you want pizza. You head down Trumbull Avenue, across the bridge over 94, and Pie-Sci is right there on the west side of the street. You head in and get a large pizza, could be a meat lover’s, could be the “Salami Kilpatrick”, and the entire family can dig in. It’s not cheap for pizza, but it won’t break your wallet; and it’s worth every penny for the incredible crust and farm fresh ingredients. It’s very satisfying. In this case, I think you’re a Durango SRT kind of person. It’s a nearly 500-horsepower AWD automobile that seats a legit 6 people. Healthy fun for the whole family! And it’s got that something special . . . it’s not just a pepperoni and cheese pizza from a chain. There’s an aggressive stance, the mean mug, and it sounds like a muscle car. The throttle is especially zesty. Dodge and SRT kept it real. It has the soul of a hot rod and you feel that behind the wheel, especially in track mode with the paddle shifters. If you wanna shake and bake, get over to Milan Dragway, put the fam in the stands and run a 12-second pass at over 100 mph! On the other hand, maybe it’s fine dining you’re in the mood for. Instead of bringing the kiddos (or dogs, if you’re me) along, you’re gonna grab a couple of friends for a night out. Downtown at the corner of Michigan and Washington sits Michael Symon’s Roast. The food scene in Detroit is blowing up, but Roast was there before the boom and remains my go-to restaurant for a big, juicy steak. You’re going into this dinner knowing the bill will climb well into triple figures, but you’re a baller, right? You catch the scent of roasting meat and get a taste of that perfectly prepared cut and you will be hooked. 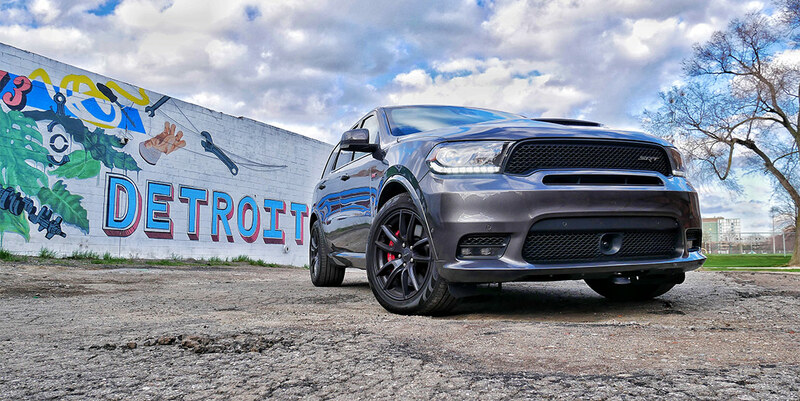 Externally, the Trackhawk is attractive, yet subtle, more so than the Durango. The noise is beautiful, but subdued compared to either the Charger or Challenger SRT Hellcats. It’s the filet mignon set on crab bearnaise next to crispy potatoes done to absolute perfection VS. the outrageous “Oooooo, BarraGouda!” butternut mac & cheese sauce with broccoli, bacon, red peppers and Gouda pizza at Pie-Sci. Yellow Brembos and quad tail pipes give the Trackhawk away, but only to those in the know. Money is money, you can always make more. Can you put a price on the permanent smile you’ll have every day, to and from work, or school, or softball practice, or to get groceries? All seasons, any conditions, any occasion. There is no need to tuck the Trackhawk away, ever. You really can eat steak every night. Both SUVs are pretty impressive tow vehicles. Let’s say a 12-second, or even a low 11-second pass isn’t enough anymore. Perhaps you’ve modded a Charger SRT Hellcat to the point where, hey, you’re running single digits and its street manners are a little rough. Pull it on a trailer and let either the Durango (8,700-lb capacity) or the Trackhawk (7,400-lb capacity) do the heavy lifting to the track. I’ve seen a couple SRT Demons on a trailer behind a Trackhawk combos that, while I’ll drive my SRT Demon anywhere, stirs up a bit of jealousy. Versatile. Lots of power. Delectable. I think it’s time to eat.